Parents and educators interested in brain development in early childhood might find themselves left with a lot of questions like: What exactly happens during different brain development stages? Or how important are art, math, and science to newborn brain development? With new discoveries being made every day about babies and their growing brains, it’s easier than ever to begin to understand what’s going on inside your baby’s head. Year one for your baby is a very important time. Studies have shown that newborns can recognize faces, distinguish between happy and sad expressions, and recognize their mother’s voice as well as sounds they heard while in the womb. During their first year, babies develop at an amazing rate, quickly gaining motor, language, and visual skills. 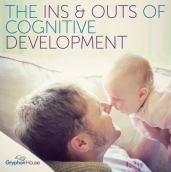 Year two is an even more exciting time for you and your baby as they begin to form more complex cognitive abilities. The most dramatic change in your baby will be their spike in language abilities. Described as a “verbal explosion,” by The Urban Child Institute, your child’s vocabulary will nearly quadruple between their first and second birthdays. Another part of this boost in development is the emergence of self-awareness and emotions as your baby begins to recognize themselves in a mirror and use personal pronouns like “me,” “I,” and even their own name. Early messages received by babies as newborns and toddlers impact them and their growth tremendously. The early years are a crucial window of opportunity to shape your child’s future achievements and happiness. Activities as simple as infant crafts and as educational as counting games, all play a role in bringing elements of art, science, and math into their developing cognition. Overall, no matter how you positively interact with your baby, you’re helping them to grow into a little learner. For more fascinating research and strategies for boosting a baby's cognitive development, check out Dr. Renate Zangl's book, Raising a Talker.